I like a good coffee in the morning. I hate carrying too much weight. After drinking machine and percolated coffee for a few years, I really cannot drink instant. On my last trip, I took coffee bags. Whilst they make an okay cup, they are never really strong enough for my liking and the waste is a bugger to carry. Last week I was told about a Swiss one cup reusable coffee filtration system. It consists of a water reservoir and a gold gauze filter, which sits atop a mug. 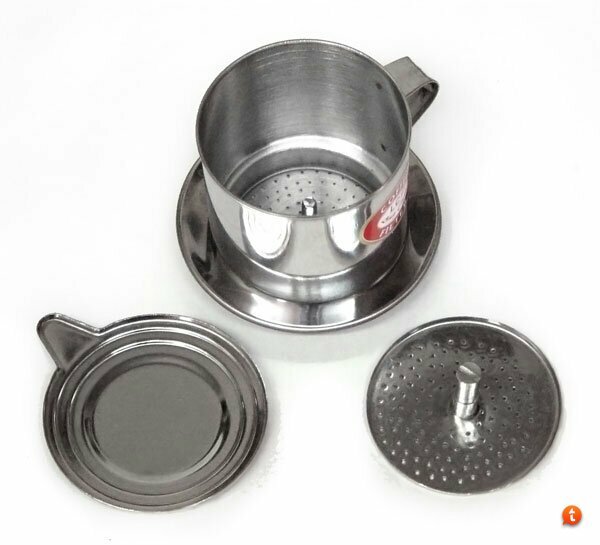 About two spoons of coffee is placed on top of the gauze filter, then the water reservoir is placed above the coffee and filled with boiling water. Two minutes later..presto. A REALLY GOOD cup of coffee. The unit is simply rinsed out and reused. I would go as far as to say, it makes a better coffee than my Italian percolator and with less residue in the bottom of the cup. I bought it at a specialist kitchenware place for 35 bucks. I raved to the shop assistant about how good this thing would be for hiking, but she just didn't get it. Anyone who wants one, just let me know. I might be able to get a better deal for a bulk order. Do you have a link to a picture of this exciting new gadget? I'm with you on the coffee bags; they're just not 'core enough, but they win over that instant crud anyday! That's the one. Having a coffee now, from the very same unit. Thanks for posting! I use coffee bags at work and whilst hiking. They are okay but some are a part mix of coffee grounds and instant coffee. I took a little stove-top espresso maker with me on an overnighter last year. Everyone on the trip thought it was pretty amusing. This is probably less than half the weight the espresso maker (and less bother). Looks good, but wouldn't having to haul around the used grounds be just as much (or more) a hassle as carrying a used coffee bag? JohnM wrote: Looks good, but wouldn't having to haul around the used grounds be just as much (or more) a hassle as carrying a used coffee bag? The used grounds are really just a thick slurry of coffee. They are completely bio degradable and I wouldn't see an issue with disposing in a long drop or composting toilet, or digging a shallow hole. One cup uses about 3 level tsp of coffee, which is very little waste. The grind used is medium fine, the same as for a percolator. To be honest, its probably more environmentally friendly to simply scatter the grounds away from camp, rather than dig yet another hole out there. But it doesn't mention espresso, which IMO is the only way to make a coffee. Surely the simplest/best method is to carry a tiny stove top espresso maker? The lightest of these are the aluminium ones without a top chamber, just having a tube to feed the glorious stuff in to your cup/mug. They really are very light and quite tiny. I just use a cheap plastic funnel with the tip cut off and filter papers - light and works well. The only down side is the funnel is a pain to pack -These http://www.gsioutdoors.com/products/pdp/collapsible_java_drip/ look like a good idea but a bit exxy ($25) here, if I order something from the states I might try one. Nice find Mutley - where did you buy it from ? Dale wrote: Nice find Mutley - where did you buy it from ? The place was called cuisine world, in Elizabeth street Melbourne. I'm sure any specialist coffee or kitchen place should sell them. Cheers for that Mutley ! I have a GSI java drip filer. They are very small and fold down very neatly. I have made a coffee at home with it and it produces a a good coffee - not as good as a percolator - but very reasonable. I ordered it as part of a bigger order so the postage was reasonable. I also ordered the GSI plunger and I have used this for a week's camping. If you have a group this is an excellent option as you can make 3 to 4 cups (short black strength) and just add water. Thanks for that -it's definitely on my list! Just did an Aussie Bing and you can get this in Australia from various websites, I youtubed it and had videos from 2009, so it aint that new. Miyata610 wrote: But it doesn't mention espresso, which IMO is the only way to make a coffee. Surely the simplest/best method is to carry a tiny stove top espresso maker? The lightest of these are the aluminium ones without a top chamber, just having a tube to feed the glorious stuff in to your cup/mug. They really are very light and quite tiny. A stove top espresso maker doesn't make espresso. It makes "moka" coffee, a completely different beverage. Orion wrote: A stove top espresso maker doesn't make espresso. It makes "moka" coffee, a completely different beverage. Having read a little more on the topic now I see that to be called an espresso machine it must produce a pressure of EXACTLY 9 bar. So I'm guessing very few espresso machines are actually that. Miyata610 wrote: Having read a little more on the topic now I see that to be called an espresso machine it must produce a pressure of EXACTLY 9 bar. According to Andrea Illy and Rinantonio Viani in "Espresso Coffee: The Science of Quality", the optimal pressure range is 9 ± 2 bar. But the main point is that espresso, unlike its stovetop cousin, is brewed under substantially higher pressure (stovetop units generate about 1 bar). This results in a number of characteristics unique to the beverage including oil droplets in emulsion and the production of crema, both absent in moka brews. I like moka coffee and I think it's a good choice for carrying in a pack. It just isn't espresso. Not sure of its weight but I'll weight it tomorrow if anyone is interested. I'm a little obsessed with coffee and will be taking mine with me no matter what. Last edited by wildernesswanderer on Wed 05 Sep, 2012 8:43 am, edited 3 times in total. I second the aeropress! Love mine, I even use it at home when I'm feeling fussy. I have also used a small Vietnamese aluminium coffee percolator when hiking - they weigh next to nothing and the fact they're best served with condensed milk ensures me a much needed energy fix on the trail. Like Mindalou I have a soft spot for condensed milk. I sometimes mix 50-50 some typical espresso coffee (Vittoria etc) with some of the Vietnamese style coffee you get in Asian supermarkets. Works a treat in the aeropress and you get a really rich flavoured brew, black or white. Just found this at my local Asian supermarket. Anyone ever used one? Cheap and feels pretty light too. Note that it is in the packaging upside down. 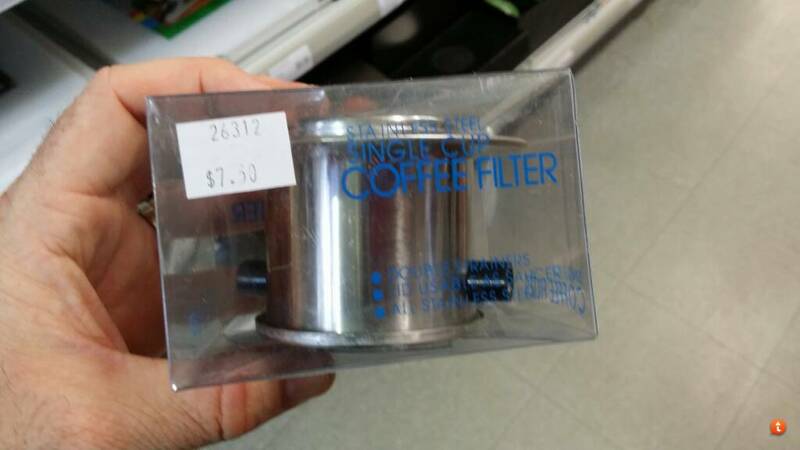 I have a gold plated filter, similar to the one shown, It was free with HARRIS coffee some years ago and makes fantastic coffee. I prefer it to expresso as I was brought up on filtered coffee. I can manage well with coffee bags. Strider wrote: Just found this at my local Asian supermarket. Anyone ever used one? Cheap and feels pretty light too. I think I got mine for $2 from Vietnam, great value as the coffee it makes it surprisingly good . It's especially good if done the authentic way with a dollop of sweetened condensed milk in the bottom of the cup! I also bought one of those in Vietnam last year, prob coz that was the best coffee you could get over there. Hasn't been used since! However, in the bush, I think the best coffee we have is coffee grounds soaked in boiling water, and then sieved through something. Beyond that, I can easily deal with coffee bags, or even Marcona coffee for a few days to a week. Or maybe just a short detox?!! andrewa wrote: Or maybe just a short detox?! !